The raid was in response to the firing on Sunday afternoon of a rocket in the direction of a popular ski resort in the north of the Golan Heights. The Iron Dome missile defense shield intercepted the incoming rocket – which significantly was a medium-range surface-to-surface, not surface-to-air projectile, and therefore could not plausibly be explained as an attempt to defend against Israeli aircraft. Earlier, Israel had struck an ammunition depot at the Damascus international airport, and in a rare break with a longstanding policy of ambiguity, commented publicly on the incident. Iranian leaders have long vowed to destroy the Jewish state, and Israel is concerned that the Syrian conflict will end with Iranian forces entrenched near its northeastern border. The commander of Iran’s air force, Brig. General. Aziz Nasirzadeh was quoted by Iranian state media on Monday as saying his forces were “impatient” to wipe out Israel. 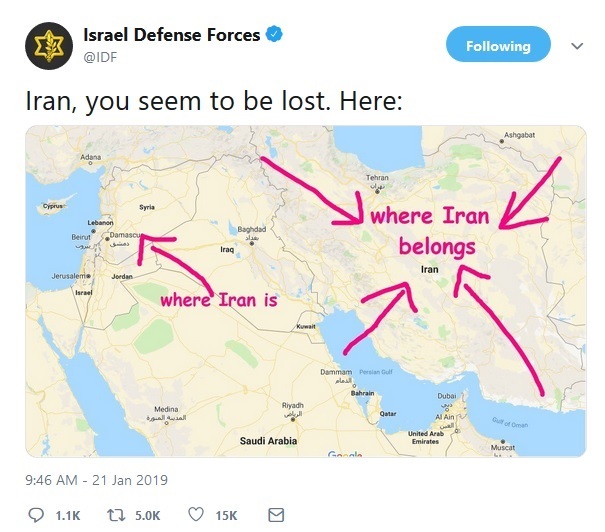 “At its foundation lies the risk that Iran, through the Qods Force, will intensify its reactions to Israeli attacks on Syria and is even prepared to enter into a limited conflict with Israel,” added Shapira, now a senior research associate at the Jerusalem Center for Public Affairs. Israel’s strikes inside Syria are causing tensions with Russia, which has been warning the Israelis to stop carrying out attacks near the Damascus airport. Russia began supplying the Assad regime with advanced S300 surface-to-air missiles last fall to strengthen its air defenses, after Syrian operators using less-sophisticated Russian-supplied S200s mistakenly shot down a Russian reconnaissance plane, killing all 15 crew members onboard. Russia’s defense ministry claimed Monday that Syrian air defenses had “destroyed more than 30 cruise missiles and guided bombs” during Israel’s early Monday air operation. The IDF, while confirming that the Syrians had launched “dozens” of surface-to-air missiles, did not comment on their accuracy or effect. The Damascus international airport is not a major destination, but carriers that do use it include Iran’s Mahan Air. The airline, which reportedly has links to the Qods Force, has long been accused of transporting weaponry and military personnel from Iran to Syria. On Monday, Germany revoked Mahan Air’s license with immediate effect, in the latest European response to Iranian intelligence and terror operations on the Continent. According to the carrier’s website, other U.S. allies currently allowing Mahan services to operate include France, Italy, Spain, Turkey and the United Arab Emirates. Meanwhile the Assad regime’s foreign ministry in a letter to U.N. secretary-general Antonio Guterres and the U.N. Security Council accused Israel of trying the prolong the civil war. “Israel’s persistence in its dangerous aggressive behavior wouldn’t be possible without the unlimited support of the U.S. administration and the immunity provided to it by the U.S. and other Security Council member states,” it complained.